When you're craving dessert, don't deprive yourself! These decadent recipes have less than 200 calories per serving, and each one can be made in 20 minutes or less. Score! These gooey sweet snacks were inspired by the Girl Scout Cookie flavor Samoas/Caramel deLites. We love them! Bring a skillet sprayed with nonstick spray to medium heat. Cook and stir coconut until lightly browned, about 3 minutes. In a medium bowl, combine ricotta, sweetener, coconut extract, and vanilla extract. Mix until uniform. Stir in half of the toasted coconut and 1 tbsp. chocolate chips. 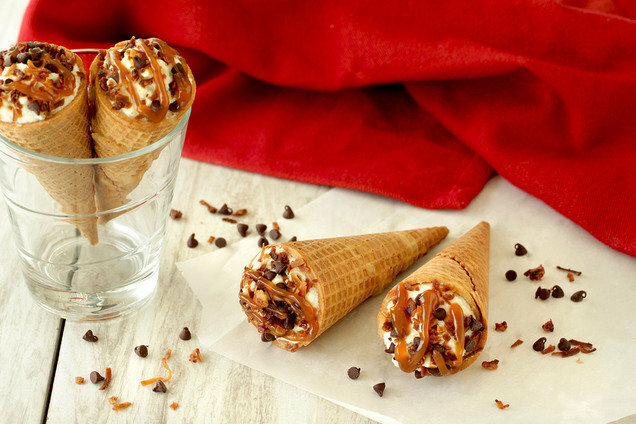 Spoon mixture into cones. Evenly top cones with remaining toasted coconut and 1/2 tbsp. chocolate chips. Drizzle with caramel. HG Alternative: For fancy cones with minimal effort, pipe the mixture into the cones. Just transfer the filling mixture to a large plastic bag and squeeze it down toward a bottom corner. Snip off that corner with scissors, creating a hole for piping the mixture. 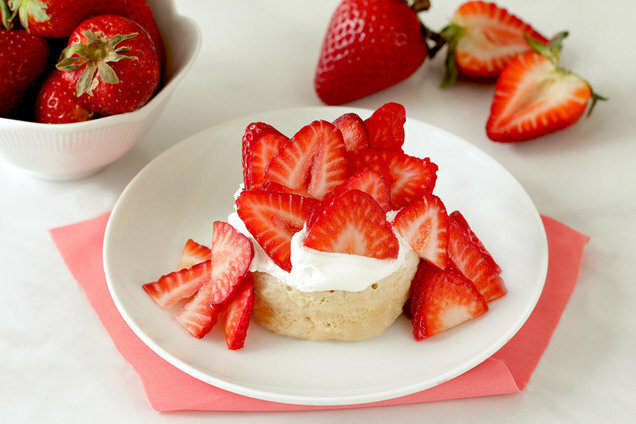 This petite treat is decadent, delicious, and loaded with whipped topping and fresh strawberries. Dig in! Spray a microwave-safe mug with nonstick spray. Add flour, sweetener, and baking powder. Mix well. Add all remaining ingredients except whipped topping and strawberries. Using a fork, whisk until uniform. Microwave for 1 1/2 minutes, or until set. Let cool, about 10 minutes. Top with whipped topping and strawberries. Hungry for More Low-Calorie Dessert Recipes? On this day in HG history, HG 200 Under 200 debuted at #1 on the New York Times Best Sellers list... way back in 2009! Can you believe it's been 8 years since then? Save your pals from dull desserts... Click "Send to a Friend" or forward these recipes!